Summary: Georgia recently enacted the Revised Uniform Fiduciary Access to Digital Assets Act which provides guidance as to who may access and manage a person’s digital assets. The legislation attempts to strike a balance between the owner of the assets, his or her fiduciary, and the custodian of the assets. A piece of Georgia legislation concerning access to digital assets has been signed by Governor Nathan Deal. Senate Bill 301, which passed in April 2018, is a bill to enact the Revised Uniform Fiduciary Access to Digital Assets Act. Many people regularly use digital assets to pay their bills, manage subscriptions, communicate with friends and family, and store their photos. Prior to the Revised Uniform Fiduciary Access to Digital Assets Act, laws did not provide much guidance as to who could access these digital accounts and files if the owner died. As a result of this confusion, companies would often delete the items or the assets would be stored online indefinitely – without friends or family being able to access them. The Revised Uniform Fiduciary Access to Digital Assets Act is designed to solve this problem, with the goal being to create a legal balance between the owner of the digital assets, his or her fiduciary (the person appointed to manage the assets, also known as the executor), and the custodian (the company who provides and stores the digital assets). The RUFADAA allows fiduciaries to manage digital assets including computer files, virtual currency, and websites. But fiduciaries cannot access items such as text messages, emails, or social media accounts unless the original owner explicitly consented to that access in his or her will, trust, power of attorney, or other estate planning document. If the original owner did not consent to access, the fiduciary may petition the court and explain why access is needed to wrap up the estate. In other words, the fiduciary could potentially override the terms of a person’s will in order to access his or her digital assets. But the RUFADAA does balance the interests of the fiduciary here with the interests of the original owner and/or the custodian. The court could deny the fiduciary’s petition. Also, the RUFADAA specifies that the custodians of the digital assets may: comply with requests for fiduciary access based on the company’s terms-of-service agreements; limit access to those digital assets deemed “reasonably necessary” to wrap up the state; charge compliance fees; refuse unduly burdensome requests; or refuse access to deleted or joint online accounts. Currently, a majority of U.S. states have already enacted the Revised Uniform Fiduciary Access to Digital Assets Act. Georgia is one of seven states that introduced enactment this year. SB301 passed in the Georgia State Senate 54-0 and in the Georgia House of Representatives 162-2. Even if Governor Nathan Deal does sign RUFADAA into law as expected, it is still a good idea to make a plan for your digital assets. You want to make it clear in your will or power of attorney exactly which digital assets you own and what level of access you wish your fiduciary or executor to have. Additionally, you can also leave a letter of instruction with account information and passwords. 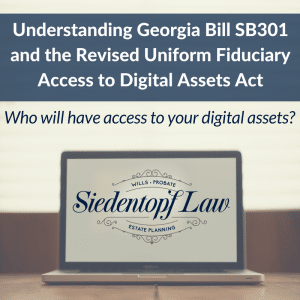 For more about digital asset protection, or to set up an estate planning or probate consultation, contact Siedentopf Law at (404) 736-6066 or visit our website EstateLawAtlanta.com. ← Video: What is a Guardian Ad Litem?